CNN interviews Sam French about the Oscar nod and catches up with Fawad Mohammadi on the streets of Kabul. Check it out! The Hollywood Reporter features a behind the scenes trailer for Buzkashi Boys. Take a look! Sam French speaks to Tracee Hutchison from the Sundance Film Festival about casting, the Afghan Film Project, nomination reactions and more! Buzkashi Boys lead actor, Fawad Mohammadi, talks to Al Jazeera about the Oscar nomination and his desire to shed a more positive light on his hometown. NBC News captures Fawad Mohammadi's tear-filled reaction to the Oscar nomination for Buzkashi Boys in Kabul. NBC's Kristen Dahlgren singles out Buzkashi Boys' Fawad Mohammadi in her Oscar nominee highlight report. Jada Yuan with Vulture writes a truly riveting piece, "Shooting a Film in Afghanistan Takes Courage, Creativity, and a Dead Goat." Sam French on WHYY's "Radio Times"
An entire hour on NPR devoted to Buzkashi Boys and the work we're doing in Afghanistan. Check it out! Check out this great piece in Wired on the Afghan film industry and Jonathan Saruk's effort to show the world another side of the country. Brief cameo by Sam French. Check out the Sound Central website for news on our Kabul premiere event! Ariel talks to Khalid Malik on The Breakfast Show. Morning Edition reports on the premiere in Kabul. 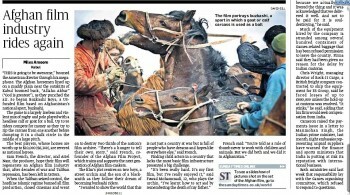 Buzkashi Boys profiled on ITV News! Nicolas Ropert reports from Kabul. Fawad on "The State We're In"
The State We're In interviews Fawad, lead actor in Buzkashi Boys, about his life on the streets and what it meant to act in the film. Sam speaks to Film Annex about the Afghan Film Project and the power of social media to effect change. Check out the video on the Film Annex website HERE or view it below. Espn.com does a great story on Buzkashi. To view the story on the ESPN page, please click HERE. Please click the image below to view it in a pdf within your browser.